Prolific munitions production keyed America's triumph in World War II but so did the complex economic controls needed to sustain that production. Artillery, tanks, planes, ships, trucks, and weaponry of every kind were constantly demanded by the military and readily supplied by American business. While that relationship was remarkably successful in helping the U.S. win the war, it also raised troubling issues about wartime economies that have never been fully resolved. Focusing on the mobilization of national resources for a truly global war, Paul Koistinen analyzes all relevant aspects of the World War II economy from 1940 through 1945, describing the nation's struggle to establish effective control over industrial supply and military demand - and revealing the growing partnership between the corporate community and the armed services. Koistinen traces the evolution of federal agencies mobilizing for war - including the National Defense Advisory Commission, the Office of Production Management, and the Supply Priorities and Allocation Board - and then focuses on the work of the War Production Board from 1942-1945. As the war progressed, the WPB and related agencies oversaw the military's supply and procurement systems; stabilized the economy while financing the war; closely monitored labor relations; and controlled the shipping and rationing of fuel and food. 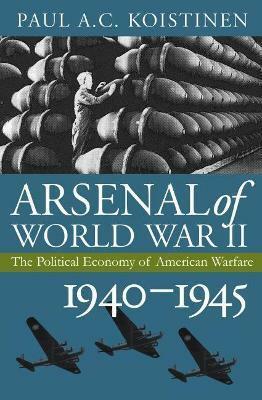 Koistinen reveals how representatives of industry and the armed services expanded upon their growing prewar ties to shape policies for harnessing the economy, and how federal agencies were subsequently riven with dissension as New Deal reformers and anti-New Deal corporate elements battled for control over mobilization itself. As the armed services emerged as the principal customers of a command economy, the military-industrial nexus consolidated its power and ultimately succeeded in bending the reformers to its will. Koistinen shows that mobilization meant more than simply harnessing the economy for war - it also involved struggles for power and position among a great many interest groups and ideologies. He provides an ambitious and enormously insightful overview of the emergence of the military-industrial economy, one that still resonates today as America continues to wage wars around the globe. Paul A. C. Koistinen is emeritus professor of history at California State University - Northridge. He is the author of Beating Plowshares into Swords, Mobilizing for Modern War, and Planning War, Pursuing Peace.